From the people who brought you the Dummies instructional book series, brings you the same non-intimidating guides in video form. This is Consumer Electronics for Dummies. 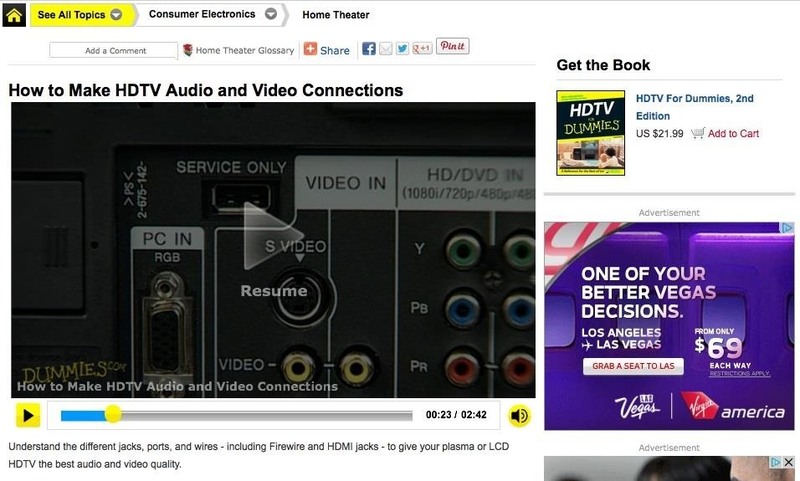 Just watch this video tutorial to learn how to make HDTV audio and video connections, For Dummies. Understand the different jacks, ports, and wires - including Firewire and HDMI jacks - to give your plasma or LCD HDTV the best audio and video quality. Would be a great page if there were actually any videos on the link. Just links you to the description of the book you can buy that tells you how to make HDTV video and audio connections. That's weird. The link works for me and the video plays fine. See screenshot below.